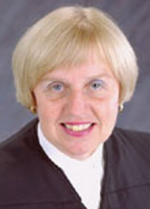 Justice Elizabeth A. Weaver was elected to the Michigan Supreme Court in 1994. She was re-elected in 2002 and resigned from the Court in 2010. Justice Weaver graduated from H. Sophie Newcomb College and Tulane University Law School. She practiced in Louisiana and Michigan before her election as judge of the Leelanau County Circuit Court in 1974. She was elected to the Michigan Court of Appeals in 1986.